This empanada recipe has ground pork and vegetables filling. 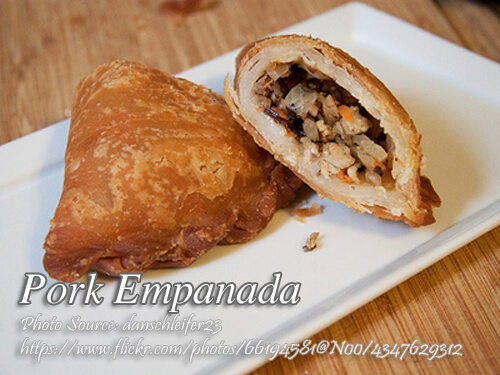 Empanada has it’s origin from Spain and it is one of the many Filipino cuisine with Hispanic influence. This is actually a type of ground pork turnover and has many variations with regard to the filling. Although a little tedious when cooking this type of food, it is not very hard. The only hard part in preparing the empanada is making the dough and wrapping the filling with the dough. But with a little practice I’m sure you can make a perfect empanada. Frying is the most convenient way of cooking this empanada but you can also bake it if you prefer it with no grease. To make the pork filling; In a large skillet, heat oil and saute garlic and onions until onions are cooked. Add in ground pork and stir cook for a few minutes. Then add salt, pepper and granulated seasoning. Stir cook for 1 minute then add potatoes, carrots and water. Simmer for at least 5 minutes and stir cook to prevent the meat from sticking on the pan and to cook it evenly. Add in the raisins, peas, bell peppers and sugar and adjust the seasonings. Cook for 2 minutes more or until the liquid has almost evaporated. This empanada recipe has ground pork and vegetables filling. Empanada has it's origin from Spain and it is one of the many Filipino cuisine with Hispanic influence. In a large skillet, heat oil and saute garlic and onions until onions are cooked. Add in ground pork and stir cook for a few minutes. Then add salt, pepper and granulated seasoning. Stir cook for 1 minute then add potatoes, carrots and water. Simmer for at least 5 minutes and stir cook to prevent the meat from sticking on the pan and to cook it evenly. Add in the raisins, peas, bell peppers and sugar and adjust the seasonings. Cook for 2 minutes more or until the liquid has almost evaporated. Set aside to cool. Combine flour, white sugar, baking powder and salt. Mix the dry ingredients using a wire whisk. Add in the pieces of butter to the dry ingredients and mix them until the butter is well mixed with the flour mixture. Add in the water and knead until the mixture turns into a smooth dough. Grab about 4 tablespoon of dough and form it into a ball. Do the same for the rest of the dough. Put in the refrigerator for about 20 minutes. In the meantime prepare a clean surface, like a chopping board, and dust with flour. Get a piece of dough and press it on the surface of the chopping board until it become flat. Using a rolling pin, flatten it further until thickness become at least half a centimeter thick. Place 4 tablespoon of filling on the center of the flattened dough. Fold the dough and seal the round edges by crimping or folding it. You can also seal the edges by pressing a fork. Do the same for the rest of the dough and filling. In a deep frying pan, heat oil about 3 cups and deep fry the empanadas for 3 to 5 minutes or until the empanadas turns golden brown. Place the empanadas in a bowl lined with paper towels to drain excess oil, Then transfer to a plate and serve. I don’t actually know where the vinegar for? in your pastry ingredient. Hi Helen, I corrected the recipe already and thanks for your feedback. sir do you have a compilation of your recipes? Hi Krizza, I only have a ebook but very few recipes in it. You can download it by subscribing on my email list. Just scroll above and you will find the link. I always refer to your site for Filipino recipes. Thanks you!! Hi Patty, thanks or visiting and hope you will visit often! Hi Dang, you are welcome!